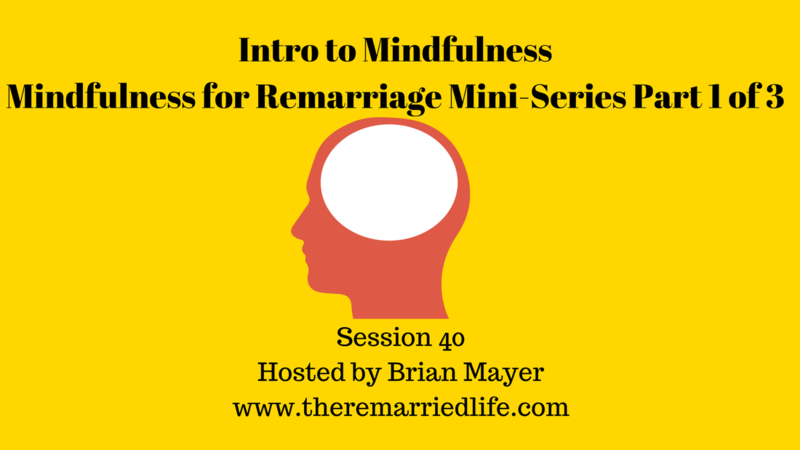 In today’s session, we start a 3 part mini-series on Mindfulness. In part 1 we will talk about what it is and why it is important. Then our next episode which is Session 41 we will be devoted to an individual mindfulness exercise that you can do to help reduce stress and feel more relaxed In the final part of the mini-series, session 42 will be devoted to a couples mindfulness exercise that you can do together that will help strengthen your connection. You can listen to these episodes anytime you need to increase focus and attention on the present moment. Our minds are constantly moving and thinking about all sorts of things even things we don’t realize. Did you know that many researchers say that we have somewhere between 50,000 to 70,000 thoughts per day. This means we might have different thought every 30 to 45 seconds. Because our minds are like computers it can be both a positive and a negative. It can mean we can multi-task but it can also mean we get bogged down in feeling stuck. This becomes problematic when we are engaged in conversations that get heated with our children or our spouse. There are two major theories on how to treat our unwanted thoughts. We can either work hard to stop them or we can simply notice them and let them pass by. Mindfulness is all about the latter in that it is all about seeing the thoughts and letting them float by. We often subconsciously believe that our thoughts must be our reality or that they are the truth. For example, my current spouse is doing similar things that my ex-spouse did therefore he or she must be having an affair. Or my son is not telling me all I need to know therefore he must be hiding something. Of course don’t dismiss facts that you see in life or overlook things, but remember to constantly be checking in to your thoughts. Are these thoughts rooted in reality or did they occur because I am stressed, we are not communicating, it reminds me of something that happened in the past, it makes me worry about our lives moving forward, a close friend just passed away, and on and on it goes. Mindfulness while it has Eastern Buddhist roots has been adapted to a more Western cultural fit. Mindfulness is simply recognizing our thoughts like clouds in the sky. They are separate and apart from us and most times not our reality. We can see them floating by and we can make the decision of whether or not we want to engage with them. If I am a Christian, does mindfulness mean I am praying to some other God? You can practice mindfulness, but focus on your thoughts and letting them float by or you can see your thoughts and distractions as they float by and then choose to return your focus to God. Does Mindfulness mean I stop praying? The answer to this is also No. You should use prayer as the number one method for communication with God. Mindfulness is simply a supplemental technique that can help you recognize when your thoughts are whisking you away to an unhelpful place. The problem with our thoughts is that they often drive how we feel. When we are tossed to and fro by our thoughts, a whole host of feelings like fear, worry, upset, anger, loneliness, and others can bubble up. Mindfulness can also help you in your conversations with your kids, your stepchildren, your spouse, your ex-spouse, your ex-spouse’s spouse, your friends, your colleagues, and your boss. In the next couple of episodes we will practice some mindfulness exercises and I can almost guarantee that you will come through more relaxed and at peace. If you practice them with regularity, you will begin to be able to more quickly release a thought that you begin to feel carried away by. This can result in more joy, peace, and content. Get ready for the next 2 episodes to be used again and again when you feel stressed or need a time-out from a difficult conversation with a family member.